These decals are based on the Aurora T-jet Hop Up kit decals. 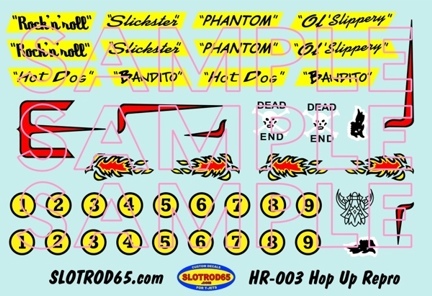 Although they are pictured on Hot Rod bodies, they can also be used on other car bodies as well. 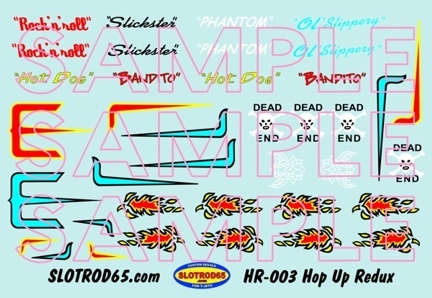 The Hop Up Repro set is a reproduction of the original decal included with T-jet Hop Up kits. This is not a scan, instead all of the clasic graphic decals from this set have been newly re-drawn so that they are sharp and crisp. 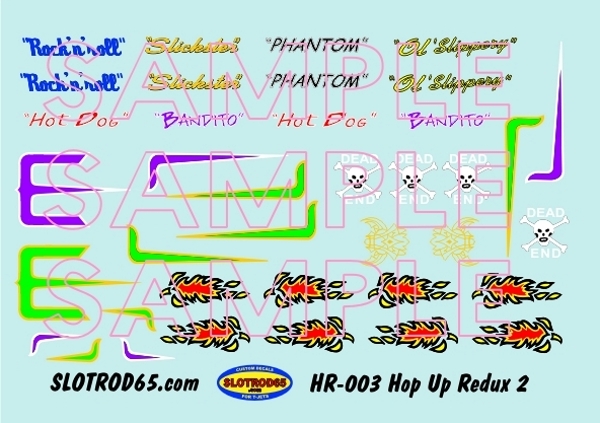 The Hop Up Redux decal set includes elements from the Hop Up set, many in different colors. Included are more of the decals you use most: More flames and more skulls! The Hop Up Redux 2 decal set has more colors, inlcuding metallic GOLD! Please note that the actual decals are far sharper than the sample scans below.